Bermuda’s Flora Duffy has claimed yet another big win, collecting the first win of the Tokyo 2020 Olympic qualifying period as she won the gold medal at the 2018 ITU World Triathlon Yokohama in Japan this weekend. Winning in Japan for the second year in succession, it was also a second straight win of the season following her gold medal win in Bermuda last month. 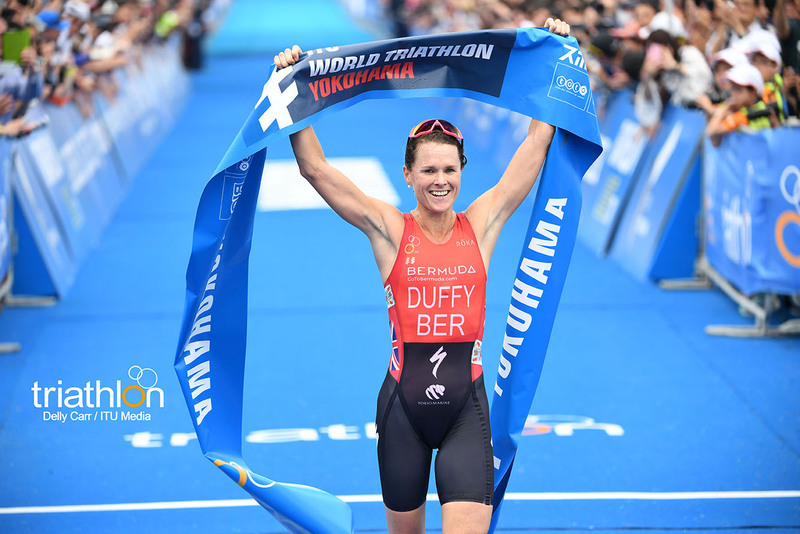 Duffy continued her streak of strong race consistency from start to finish after leading out of the swim, remaining in the lead bike pack and then stealing the race away in the run, which ultimately left her at the top of the Series leaderboard in the WTS rankings. “That is very cool, I was not expecting that today, that was not the goal. It was just to get a good score and set myself up for the Series, but if I am top then I can’t complain,” Duffy added after finding out her Yokohama win left her top of the Series. Claiming the silver medal was USA’s Katie Zaferes who also collected her second straight WTS podium of the season. Britain’s Non Stanford finished with the bronze, her first WTS podium since 2016. The Yokohama race was the opening race of the two-year Olympic qualification period, and a slight chop in the water welcomed the women as their dive officially kicked off the long road to Tokyo 2020. While some strong names remained in the main chasing group, including Australians Ashleigh Gentle and Charlotte McShane, they couldn’t find the edge and close the gap, which remained around the minute mark for the duration. Despite a few attacks from Duffy through the final laps, no further breakaways stuck and the leading nine rode into the second transition together, the gap to the chase now 1:14. After a tough ride, Stimpson and Duffy were the first and freshest out of the transition gate followed by Zaferes. Then Duffy and Zaferes overtook Stimpson and once again were locked side-by-side out front. Duffy wasted no time in showcasing that she has also become one of the top runners in the field. The Bermudian blasted away from Zaferes in the first lap and never looked back, holding onto a lead that was never truly threatened. Duffy entered the finish chute in control in Yokohama for the second year in a row, this year capturing the fastest run split of the day at 33:26. What a race. Flat bike course, got chased down, but powered away on her run. Once Flora’s weakness, now another one of her strengths. Impressive. Today’s Flora would have taken the gold in Rio. Very proud of you Flora!! Very Proud of you Flora. Way to show the world what a small island can produce. You are a true Bermudian treasure. You are a wonderful role model for young Bermuda athletes. Flora you are Bermudas feel good story ! So proud! Bermuda has a world and soon to be Olympic champion,don’t know when this will happen again so lets live in the moment. Congrats Flora!!! On your home soil, and again….. In the land of the rising sun!! GO FLORA GO!!! !